Become an Ambassador of the Global Social Movement TWO HOURS FOR THE FAMILY. We invite all companies to join the group of Ambassadors for the Two Hours for Family. Last year’s edition spontaneously crossed the borders of Poland. We were in Kazakhstan, Germany and the Czech Republic. In 2018, we took the challenge to make the TWO HOURS FOR THE FAMILY run around the world. We want to invite you to this challenge and become Ambassador of the Global Social Movement Two Hours for Family! When we initiated the campaign in 2011 in Poland, we did not realize until now what phenomena it was able to run. From the perspective of seven years, we can say that the idea of ​​Two Hours has turned into a spontaneous Social Movement for conscious, deep relationships that is happening both in Polish families and in Polish companies. The importance of the campaign has also been noticed in the field of systemic prevention of social alienation and action for emotional health of the society. What can be better to support health than people who love and feel loved, give attention to others and also receive it. You probably know the movie “Pay it Forward ” with Helen Hunt and Kevin Spacey. Every great idea begins with a human, his faith, commitment and the first movement he will make. We want to launch this potential and your power and reach the largest number of companies and people in the world. 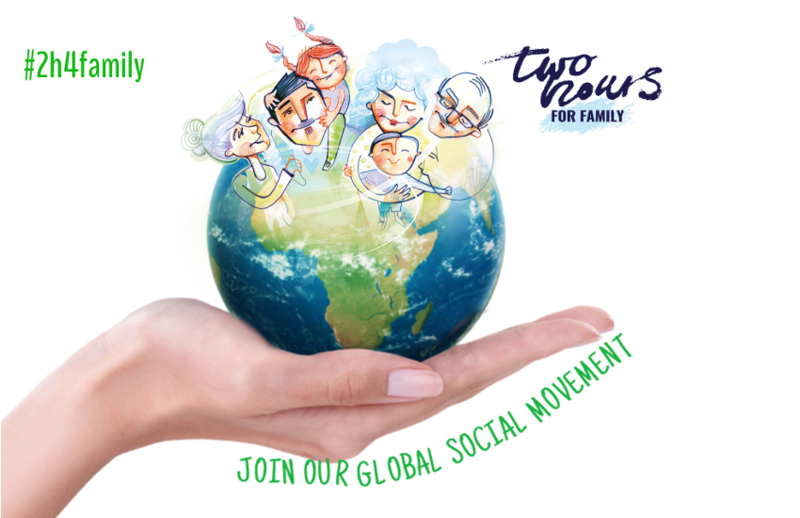 BECOME AN AMBASSADOR OF THE GLOBAL SOCIAL CAMPAIGN “TWO HOURS FOR FAMILY”. Look among your business partners, friends from other companies, people who are close to topics related to work-life balance, well-being and relationships. Send them a message about our Action. You can use our sample mail for contact – you can download it here. In the example mail we have included links to the presentation of the Action and the Foundation. They can also be downloaded from the Downloads page. Together, we can check that the International Family Day is gaining a new dimension all over the world and for two hours, people around the world will be immersed in experiencing closeness, love and happinnes.